Many of the components of Network Functions Virtualization (NFV) have come from community-led developments that were initiated primarily for enterprise implementations. Seeing the benefits of network virtualization achieved by the enterprise, the telecom industry is keen to jump on the bandwagon. But telecom networks have significantly more stringent requirements to meet performance and uptime service level agreements. 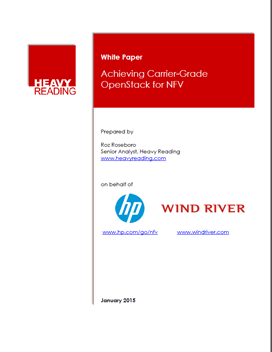 This paper by Heavy Reading discusses how HP and Wind River have innovated on top of open source efforts to address the performance, scalability, resiliency, reliability, security, and manageability requirements for telecom.